With this trip, you can seek peace and pleasure in a memorable trip to the nature reserve and national park. We board a boat to cruise on a windy river through limestone karsts jutting out of rice fields. A visit to Pu Luong Nature Reserve with less tourists before we cycling to Cuc Phuong National Park. The primitive tropical forest of Cuc Phuong has been attracting visitors since 1960. Cuc Phuong is famous for its rich animal and plant life and the dozens of ancient caves that can be found within the forest. The most interesting cave is, perhaps, Nguoi Xua or the cave of Ancient man where prehistoric stone – made tools have been found. 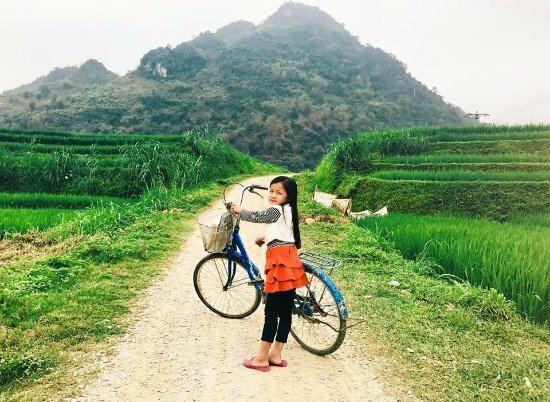 Trekking in Mai Chau and meeting ethnic minority people, trekking along the authentic and unspoiled off-the-beaten-track in Pu Luong. Exploring Vietnam's first national park and the country's largest nature reserve, and visiting ancient human caves and ancient tombs while admiring hundreds of flora and fauna species. Visit King Kong island, where the movie Kong: Skull island was made. The trip can accommodate different levels because you can cycle as little or as much as you like. If you get tire, just jump in the support van. Experienced cycling tour guide will accompany with you from the start to the end of the trip. Tour will start from your hotel in Hanoi. Tour guide of Ultimate Odyssey will pick you up at your hotel in the early morning for a 4-hour drive to Mai Chau, the gate to the northwest of Vietnam. After 160 kilometers, with a winding road through a stunning view of mountains and farms, you will stop at Mai Chau, a hometown of the White Thai hill tribe renown by their houses on stilts. You will have a lunch there at a local restaurant before taking a short walk around the village to see their daily work, embroidering and trying Thai traditional costumes. After lunch, in the afternoon, take a short ride along Ma River before going off the main road and starting to cycle by mountain tracks, enjoying new and different images of landscape. After 20 kilometers of cycling, you will reach Kho Muong Village where belongs to Pu Luong Nature Reserve, a peaceful village of Thai hill tribal people. If there is time, you can join the ordinary life of locals in their farming works, cultivation, or herding buffalo. After breakfast at homestay, you will have a long hard day for cycling by leaving beautiful Kho Muong Village to get up and down paths with a messy mixture of rocky mountains and slippery soil, as well as winding and extreme ascending routes. On thr way, you can enjoy a wonderful view of landscapes with houses on stilts, rice terraced fields, and the farming work of local people. Stop en route for lunch at Pho Doan local market, then continue an easier cycling along a calm river, with stops for pictures or refreshment at bamboo waterwheels. The support minivan will meet you in the afternoon to head to Cuc Phuong National Park for your overnight stay. At 130 kilometers south of Hanoi, Cuc Phuong is a typical limestone area and rainforest with an impressive collection of animals and plants. Seriously and carefully reserved by the government, Cuc Phuong National Park boasts some 2,000 distinct species of flora, including more than 50 varieties of orchids and giant impressive trees, some of which are over 1,000 years old. There are also 262 species of animals including reptiles, monkeys, flying squirrels and even wild horses make their home in park. Enjoy full-day cycling in the park under the umbrella of century-old trees to explore the forest and trails within the park karst ecosystem, which will give you an overall conception of the nature protection in Northern Vietnam. After breakfast, you will leave Cuc Phuong for a short ride to Hoa Lu, on the way you will have 20KM cycle to the ancient capital with the old temples dedicated to King Dinh and King Le who reigned in the 10th century. This is an outstanding switch from the three-day cycling over the mountain and rainforest to a new discovery of the low plain land for two hours through a rural village, passing rice paddy fields and rural houses. Have lunch before taking a two-hour boat trip in Trang An. Trang An is a scenic area near Ninh Bình, Vietnam renowned for its boat cave tours. On 23 June 2014, at the 38th session of the World Heritage Committee in Doha, the Trang An Scenic Landscape Complex was inscribed as a UNESCO World Heritage Site. In the afternoon, say goodbye Ninh Binh, we will return Hanoi by car. This tour follows asphalt roads, and one dirt road passing the countryside and the rice field. The back road along the river and village is small but good enough for cycling, less busy. A little bit sandy, narrow road, tiny lane, rural road along river side. Are you a beginner or professional biker? we all care with our best efforts to make your trip superb. Enjoy your riding speed from 10km per hour up to as many more as you can. If you would like easy cycling mode, whenever you feel tired, just jump on the minivan. Rainy season from May to end of October. Dry season is the rest of the year. We bike all year round while raincoat is standby in the rain season.